Chatham—Arch Historic District is significant for its vernacular late 19th-century architecture and as the home of a group of African American families. Located just northeast of the original Mile Square between Lockerbie Square and the (Old) Northside Historic District and adjacent to the Massachusetts Avenue Historic District, this residential area has a number of late 19th- and early 20th-century houses, churches, and several commercial buildings. The name of the neighborhood often raises curiosity. John Wood, Sr., first attached the name “Chatham” to this part of town. Wood came from New York State in 1834 and platted a portion of the area in 1836. He named Chatham Street (later renamed Park Avenue). In the 1860s, another landowner named Arch Street. In the 1970s, neighborhood advocates combined the two place names. Most architecture is Queen Anne in inspiration. Gabled cottages embellished with porches in a variety of patterns fill the streets of the district. Construction tradesmen and their families initially occupied many of these cottages. Most had emigrated from Germany. Many attended St. Joseph Catholic Church on College Avenue in the district. Some families built larger, brick Italianate homes. A majority of early owners were German American shopkeepers or professionals. The College Avenue corridor near 11th Street developed during the streetcar era. In 1894, German merchant August Buschmann built the red brick and limestone commercial block at 1022-1036 North College Avenue, now finely restored. Other nearby apartments had commercial spaces on the ground floor. The district also includes a firehouse on 11th Street constructed in the Tudor Revival style in 1932. A recent owner has ingeniously converted it to a residence. 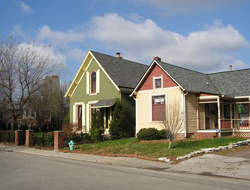 Several significant buildings are linked to the African American heritage of Indianapolis. Allen Methodist Episcopal Church at 629 East 11th Street and an adjoining early sanctuary are among the few traces of an African American community that existed in the area. The church conducted classes and became a significant cornerstone of black settlement in what was once an outlying section of the city. Chatham—Arch Historic District is bounded by I-65 and 10th St., College Ave., and East St., on the near northeast side of downtown. Homes are private and not open to the public. INDYGO bus line from downtown: The Blue line shuttle takes passengers from one side of downtown to another.